The Samson story is a good one, and well known. Students making their first forays into classical Hebrew prose rightly learn it thoroughly, and these two lines in verse 15:16 (בלחי החמור חמור חמרתים בלחי החמור הכיתי אלף איש), with the word play and the rhythm, make a good inhabitant of the memory’s palace. For fun, here they are in a few more languages, and some vocabulary in case students of any of these languages are reading. 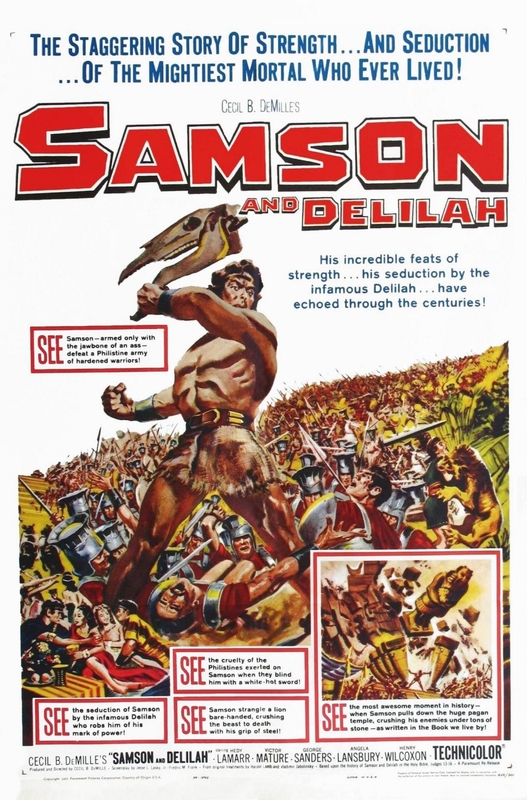 Poster for Cecil B. DeMille’s Samson and Delilah (1949). Source; cf. this one. Greek Ἐν σιαγόνι ὄνου ἐξαλείϕων ἐξήλειψα αὐτούς, ὅτι ἐν σιαγόνι ὄνου ἐπάταξα χιλίους ἄνδρας. A particular advantage that the student of modern spoken languages has over the student of languages only studied from texts, so-called dead languages, is that of having hour upon hour of spoken samples, whether conversational or simple reading (as at Librivox, where you can search here by language), scripted or ex tempore, of the languages in question. At least in some settings of instruction and reading in ancient languages, those languages are treated as living, and efforts are made to do lots of reading aloud with practiced fluency. My own experience in learning ancient languages fits this picture, for which I am grateful. (There are also some teachers and students who attempt to use the ancient languages in an even more living way, as I mentioned in the third paragraph of this post.) In countries and communities where there is some continuous reading tradition (e.g. Old Georgian in Georgia, Gǝʿǝz in Ethiopia), even where the form of the language has changed, reading is very often still an oral practice, and even elsewhere students who happen to read ancient languages with a professor who sees value in reading aloud will naturally have plenty of opportunity to exercise their ears with the language as heard, but not every student has that advantage, especially not autodidacts. Where, for example, can students of classical Armenian hear samples of Movsēs Xorenac‘i or the Yaysmawurk’? Where can students of Coptic hear some homilies? And so on. So, dear readers, I would like to gauge potential interest in such a Repertorium lectionum vivarum orientalium. Would you, as students and instructors, find something along these lines useful? Do you have any other remarks on the prospect? I would also be glad to hear about the practical settings of your language learning experiences: was your reading usually viva voce, did you typically translate into another language, etc. Until next time, πρόσεχε τῇ ἀναγνώσει, μακάριος γὰρ ὁ ἀναγινώσκων! For a little while I’ve been compiling bibliographic material with Zotero on 1) Old Georgian and 2) Eastern hagiography. With the hope that they might be useful to others, I’ve made them publicly viewable (adding and editing is restricted). Please note: neither bibliography is even nearly comprehensive, and I add new items regularly! Of course, corrections, suggestions, and additions may be sent to me by email (but for additions, please note that an item’s current absence from the list does not necessarily indicate my ignorance of it; i.e. I have an ongoing mental list of things to include). Why are these bibliographies needed? For Old Georgian, certainly one of the lesser studied among languages of the Christian east, having in one place a list of resources on the language itself and texts in that language (with translations) will provide access to the available materials for scholars across various disciplines. (There are very many resources on Old Georgian written in Georgian and Russian; for the time being, these are omitted, but I hope to rectify that lack in the future.) For eastern Christian hagiography, what do we have? The fundamental resource, BHO, is now over a century old. More recent bibliographical projects, some still currently underway, have focused on particular traditions or languages, but hagiography, perhaps more so than any other genre, is a perfect arena for cross-linguistic study, and having a way to see hagiographic material for this or that saint in all of the languages known is a definite boon. Obviously, indication of available manuscripts for the texts named would be very useful, but that kind of compilation and presentation is a beast of an effort; for now, the first focus is on published material, especially published material post-1910, the date of BHO. Here they are: Old Georgian and Hagiographia orientalis. As you have need, check them by browsing, searching, or using the tags, and subscribe to the feed, if you like. Share freely! These are humble beginnings, but I hope even these first steps will be useful to others! As vol. 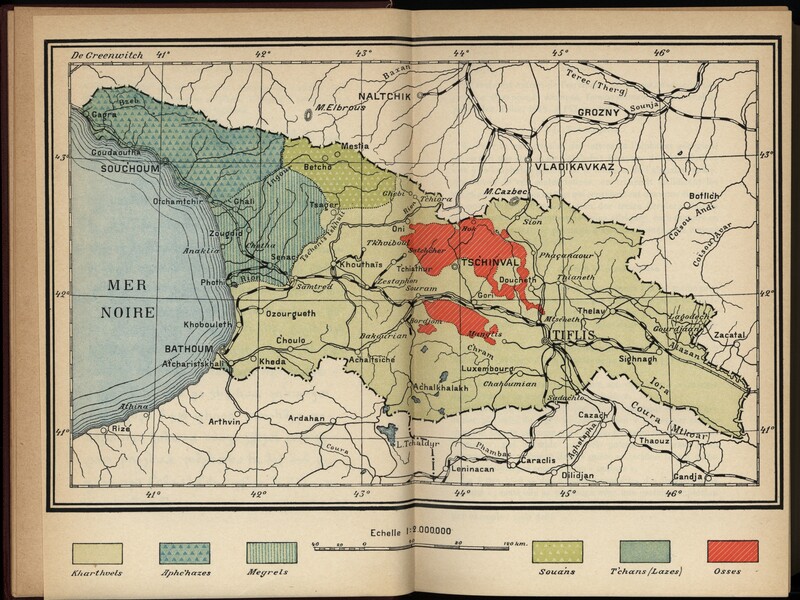 4 of the Deutsche Aksum-Expedition appeared Enno Littmann’s Sabaische, Griechische und Altabessinische Inschriften (Berlin, 1913). Despite the book’s age and importance, I found no copy online, so, thanks to HMML staff, it’s now available at archive.org. Enno Littmann was one of the outstanding scholars of the Semitic languages, those of Ethiopia in particular, in the first half of the twentieth century. (The German Wikipedia article is not very long, and the English one is almost nothing more than a list of a few publications.) Edward Ullendorff, in his obituary for Littmann published in Africa, Oct 1958, p. 364 (and reprinted in his From the Bible to Enrico Cerulli, p. 194), concluded “Among the greatest éthiopisants of the present century, Guidi, Praetorius, Conti Rossini, Marcel Cohen, Cerulli, Enno Littmann’s name occupies a most honored place.” Littmann himself wrote an autobiographical sketch (“An meinem Grabe zu verlesen”), and it is published at the beginning of the catalog of his library: The Library of Enno Littmann, 1875-1958 (Leiden, 1959), with an introduction by his student, Maria Höfner. In addition, pp. 52-57 of Ernst Hammerschmidt’s excellent little book Äthiopistik an deutschen Universitäten (Wiesbaden, 1968) discuss Littmann’s activities and contributions. Incidentally, I have before referred to a brief book inscription by Littmann among HMML’s holdings. There is a much more recent book that collects early Ethiopian inscriptions (E. Bernard, A. Drewes, and R. Schneider, Recueil des inscriptions de l’Éthiopie des périodes pré-axoumites et axoumites [Paris, 1991]), which is unfortunately not plentifully available, but in any case, Littmann’s work is not to be dismissed. He was an expert philologist and his judgement is always worth consideration. In his presentation of the inscriptions, there are black-and-white photographs, line drawings, transcription into a usual printed type — a presentation in Hebrew letters is included for the South Arabian inscriptions, and the Old Ethiopic material is given in both the South Arabian script and in (now vocalized) Fidäl —, German translation, and commentary. The book is beautifully typeset, something we see too little of these days! Anyone working on the history of Ethiopia in antiquity and late antiquity and anyone likewise interested in epigraphy generally or in the languages used in Ethiopia will find Littmann’s book, now almost a century old, still a worthwhile volume. While (Old) Georgian is generally thought of as one of the big six languages of eastern Christianity — considered, that is, apart from Greek and Old Church Slavonic — it seems to have fewer researchers than the other five languages: Arabic, Armenian, Coptic, Gǝʿǝz, and Syriac. Those of the Semitic family have a long history of research in Europe from the 16th century on and knowledge of one naturally builds toward knowledge of another. Athanasius Kircher and others before and after him worked on Coptic, the study of which was rejuvenated in the mid-20th century with the discovery of the Nag Hammadi codices (in quite a more lasting way, we can be sure, than that due to the recent hullabaloo-accompanied discussion of the so-called Gospel of Jesus’ Wife). Armenian, while still a language and a tradition apart, is nevertheless an Indo-European language and so not really so foreign linguistically as it may seem to most American and European scholars. But, compared with these languages, Georgian stands furthest away, both for its linguistic uniqueness and perhaps for the distinct Caucasian stamp it shares with Armenian. Scholars writing in Georgian and in Russian have published extensively on the language and its literature, but aspiring students who can’t read those languages have much less to work with. That which is available in the commonly read European languages is mostly in French and German (some of which was translated from Russian or Georgian), and only recently has anything appeared in English. It is well known that Lord Byron had a strong interest in Georgia and its culture. More substantively in the 18th century, Marie-Félicité Brosset (1802-1880) wrote Éléments de la langue géorgienne (1837), a grammatical guide giving attention both to the literary language and the “vulgaire,” including some reading exercises at the end, only one of which might be surely classified as Old Georgian: The Martyrdom of David and Constantine (pp. 268-283); it has the text in Georgian, Brosset’s (now idiosyncratic) transliteration, literal phrase-by-phrase or word-by-word French translation, and a more fluid French translation. More recently came Zorrell’s brief (handwritten!) grammar for reading the Georgian version of the Bible and then N. Marr and M. Brière, La langue géorgienne (Paris, 1931), at the end of which are reading selections in all three scripts (the majority being in mxedruli). The author of the tome considered in this post, Heinz Fähnrich — see on him auf Deutsch here, and in Georgian here; at the latter is a picture of him with renowned Georgian scholar Ak’ak’i Šaniże (1887-1987; see here, very brief, in English and more here in Georgian) — earlier penned a 100-page survey of the language in English (mostly made up of paradigms), and in English we also have the recent, short treatment by Kevin Tuite. Longer than the latter, but still very compendious (and in German), is the little book by R. Zwolanek, with J. Assfalg’s assistance. (See the bibliography below.) This is decidedly not a complete list of grammars for Old Georgian, but it suffices to show the context into which Fähnrich’s new work comes. This new book is hardly the first grammatical work by Fähnrich on Georgian, even in addition to the translation of Šaniże’s grammar and Fähnrich’s survey in English (see the bibliography below); these works are not closely compared with the new book here. That book appeared in 2011 (or 2012, see below) in Brill’s Handbuch der Orientalistik series. Including bibliography and index, it finishes at 856 pages. The book treats Old and later Georgian separately (15-498 and 511-828), but there is a handy discussion of main differences between the two at pp. 499-510. Most of what I have to say here has to do only with the part on Old Georgian; I studied the second half of the book in much less detail. There is some confusion concerning the book’s publication details: the copyright date in the copy I studied is 2012 (also on the title page), but the ISBN there leads one to an Introduction to Altaic Philology (2010)! The ISBN on the back cover of my copy leads one to the correct book, it seems, but the stated publication date for that one is 2011, and in any case, that is the only appropriate volume that comes up when you look at the author’s books at Brill’s site. Not surprisingly, the cost is exceedingly prohibitive: €217/$298 from Brill, and used copies available through AbeBooks are only moderately cheaper. Now, I point out the book’s strengths. Such judgements are, of course, at least partly subjective, but even so they will serve to give a more precise idea of the book than one might glean from the blurb of a bookseller. Another not strictly grammatical topic, but one especially important for a non-current literary language, that Fähnrich covers is the corpus, i.e. Old (15-46) and later (514-528) Georgian literature. While serviceable as surveys, these sections would be all the stronger with full references to editions and at least a few textual and literary studies, where they exist. The fact that the book covers both Old and Modern Georgian in one volume will be appreciated by some linguists, both Kartvelologists and others, and especially worth highlighting here is the aforementioned concluding part of the first main part of the book: “Veränderungen vom Alt- zum Neugeorgischen” (499-510). I turn now to some complaints I have about the book. One of the biggest problems with the book is that the sources of text citations are not given. Those from the Bible might be easily identified, but not so with the rest of Georgian literature! Supplied references would be of use not only to those who want to check the further context of a particular word form or syntactic usage, but also to those who are struck by the content itself of an example sentence and who wish to see more. Supplied references also confirm without a doubt the genuine existence this or that form, that it is not a mere contrivance of a grammarian. A quibble: Why is the section “Stammwechsel bei Verben” (370-371) classed under syntax? This is simply suppletion, and not really a feature of syntax, even though it may the case that “[i]n der altgeorgischen Sprache sind Morphologie und Syntax eng miteinander verflochten” (328). (Whether this is really more characteristic of Georgian than other languages is another question.) While a language’s grammar (understood in the fullest sense) is in fact “an integrated system” (cf. § 1.8 in Dixon, Basic Linguistic Theory, vol. 1) — sections on “morphosyntax” that are sometimes found in grammars bear some witness to this recognition — and so suppletion touches aspects of both morphology and of syntax, in a work ranged according to that traditional tripartite structure of phonology, morphology, and syntax, which Fähnrich’s is, questions of “Stammwechsel bei Verben” are to my mind misplaced if they appear under syntax. Some long spans of the book consist almost entirely of paradigm after paradigm after paradigm. We expect this in books with titles like 501 [insert language adjective here] Verbs or [Language] Grammatical Tables, but in a bald form such as here it is not an advantageous characteristic of linguistic description. (The same criticism might be raised against Fähnrich’s English survey of Old Georgian.) These paradigms will, to be sure, find some occasional use by certain users in certain circumstances, but more description and explanation, less enumeration, would have better made up what purports to be a fairly comprehensive guide to Georgian as a language. As for the arrangement of the book, in rather non-Teutonic fashion, sections are not numbered and subnumbered ad nauseam. While we may appreciate not being brought ad nauseam, some demarcation and clear marking of divisions with an easy system of reference would certainly have made the book more navigable. The typography of individual letters, words, and lines (in German or in Georgian) leaves little to be desired, but the same cannot be said for the mise-en-page. There is almost no space in the margins, which not only makes the reading experience itself less pleasant, but also leaves little room for notes (only 1/2 inch outer margins). Indeed, a quick glance at one of this volume’s pages reminds one unfortunately of a document produced using the default settings of Word! (With which contrast the default for a document in LaTeX!) In addition, straight (rather than curved) quotation marks are used, which lends an overall cheap appearance to the book, something hardly appropriate for a book the personal possession of a hard copy of which will devour a few hundred dollars or euros from one’s bank account! I praised above the inclusion of the section on lexicon. The part on loanwords includes a few remarks particular to each case that touch on historical or sociolinguistic factors of language contact thought to have been conducive to linguistic influence, and it is classified according to language (or, at least, family) of origin, but Fähnrich does not actually gives the words in those original languages. Perhaps he assumed that scholars familiar with the source languages could come up with the original words easily enough themselves, but such scholars are not the only people who might find the data of interest. The appearance of Fähnrich’s new book is not unwelcome. With the paucity of materials on Georgian available in widely read European languages, we might welcome almost any attention to the language, especially one with the kind of detail given here. But the $300 price tag certainly limits its distribution and therefore its use, scans of the book notwithstanding. From the perspective of Old Georgian, the one from which I am writing here, the book takes its place among the detailed grammars of Šaniże(Schanidse)-Fähnrich and Marr-Brière, but what does it add to what has been available in them for decades? The strengths that I indicated above — and there are probably more — do make the book stand out, but we do not yet have before us a reference grammar of Old Georgian that will stand for decades as the main go-to resource for students and scholars of the language. Such a work must be not only authoritative in analysis and explanation, it must also be comprehensive in linguistic and textual scope, based on clearly defined sources, preferably with examples from those sources clearly indicated, easily navigable, accessible (i.e. widely distributed), and at least relatively affordable (I would say under $150 or so). And it would not be a bad thing for its author, where needful, to break out of the traditional tripartite mold of grammatical presentation mentioned above and well-known to all of us by bowing to linguistic common sense and being well-versed in up-to-date — I acknowledge the constant movement of this adjective and thus the frequent evolution of its meaning! — linguistic theory. Finally, while the great majority of scholars, but not necessarily students, who might be interested in a Georgian reference grammar can work with German, it is, for better or worse, probably the case that this wished-for book will garner broader readership with English than with German. In the meantime, we can spend our efforts studying those easily available Georgian texts — there are some published in Georgia that are unfortunately very hard to find — in CSCO, PO, Le Muséon, and elsewhere, publishing new texts, making translations, and studying the language itself more closely, and as we do we have the aforementioned grammars, including the one here under review, whose author (with Surab Sardshweladse) has also given us a monumental dictionary. There is very often something amusing in the vocabulary, phrases, and sentences taken out of context that one meets in grammars, whether they are intended for pedagogical or reference purposes, and dictionaries. Here listed from the Old Georgian part of Fähnrich’s work are but a few phrases or sentences useful not only for remembering particular grammatical forms, but which will also serve us well at the next cocktail party we attend. Because Fähnrich fails to cite his sources, I cannot easily give them (although the places of some can be guessed), but I do give the page in his book where these occur. Cf. Ullendorff’s remarks on the curious presences and absences in Armbruster’s English-Amharic Vocabulary (An Amharic Chrestomathy, 5). Fähnrich, Heinz. Grammatik der altgeorgischen Sprache. Hamburg, 1994. ——–. Kurze Grammatik der georgischen Sprache. Leipzig, 1987. ——–. “Old Georgian.” In Alice C. Harris, ed., The Indigenous Languages of the Caucasus, Vol. 1, The South Caucasian Languages. Delmar, N.Y., 1991. Pp. 129-217. Marr, N. and M. Brière. La langue géorgienne. Paris, 1931. Schanidse, A. Altgeorgisches Elementarbuch, 1. Teil, Grammatik der altgeorgischen Sprache. Trans. H. Fähnrich. Staatsüniversität Tbilissi Schriften des Lehrstuhls für Altgeorgische Sprache 24. Tbilisi, 1982. Sardshweladse, Surab and Heinz Fähnrich. Altgeorgisch-Deutsches Wörterbuch. With the collaboration of Irine Melikishvili and Sopio Sardshweladse. Handbook of Oriental Studies, Section 8, Uralic & Central Asian Studies 12. Leiden and Boston, 2005. Tuite, Kevin. “Early Georgian.” In Roger D. Woodard, ed., The Cambridge Encyclopedia of the World’s Ancient Languages. Cambridge, 2004. Pp. 967-986. Zorell, F. Grammatik zur altgeorgischen Bibelübersetzung mit Textproben und Wörterverzeichnis. Scripta Pontificii Instituti Biblici. Rome, 1930. Zwolanek, Renée. Altgeorgische Kurzgrammatik. With the collaboration of Julius Assfalg. Orbis biblicus et orientalis, Subsidia didactica 2. Freiburg and Göttingen, 1976. When I studied Hebrew in graduate school, part of my work included translations from English into Hebrew, and after shorter sentences, I moved on and did parts from Weingreen’s Classical Hebrew Composition, a book rare at the time but which may have been reprinted since then. (See mention of this book, and some remarks related to the theme of this post, particularly in terms of Hebrew, here.) Composition into a language one is learning, even an ancient one, used to be very much the norm, so much so that you would be hard-pressed to find a 19th-century learning grammar (as opposed to a reference grammar) that does not include some composition exercises. I confess that I am not well-read on research (the latest or otherwise) for second-language acquisition and its pedagogical concerns, but speaking merely from personal experience, assuming there are adequate resources for it and a way to check it (preferably by another human being who knows the language better), second language composition is an excellent learning practice, not to mention possibly fun, depending on the material to be translated. Optimally, there should be a “known language” to “language being learned” glossary, with idioms, and a key, and the sentences to be translated ought to be based closely on passages that have been read. Good stand-alone dictionaries will of course also have idioms included. Exercises for compositions and translations into Greek and Latin abound in classical textbooks, especially older ones. For work like this, a kind of practical vocabulary, one that is often not derivable from dull vocabulary lists at the end of language lessons in grammars, is necessary. Ancient, late antique, and medieval commentaries—there are immediate examples for Greek, Latin, Syriac, Arabic, Armenian, etc.—can be very helpful here, as can even later texts when they are written in an ancient language, as the compilers of the Delphin editions, a number of which, but far fewer than the entirety, are available online, recognized. A similar method was put to good use more recently in Waldo Sweet’s reader of Vergil’s Aeneid, Books I and II, which has the text, a facing Latin prose paraphrase, and commentary on certain passages from Servius and other commentators. Eleanor Dickey has made some material like this in Greek more approachable in her Ancient Greek Scholarship (Oxford, 2007). Some classicists will also know of the method pushed by W.H.D. Rouse (see especially his Scenes from Sixth Form Life and A Greek Boy at Home, as well as The Teaching of Greek at the Perse School) and latterly the similar work of Hans Ørberg for Latin and the Italian adaptation of Athenaze by L. Miraglia for Greek. These all stress real direct use of the language and reading and composing without translation as an intermediary crutch. For one of the volumes (Sermones Romani ad usum discipulorum) in the Lingua Latina per se illustrata series, Ørberg used to good effect the Latin part of some colloquia (the original also has Greek) published with the Hermeneumata Pseudodositheana (ed. G. Goetz, Leipzig, 1892). Do you set your name in the scroll of youth, that are written down old with all the characters of age? Have you not a moist eye? a dry hand? a yellow cheek? a white beard? a decreasing leg? an increasing belly? Is not your voice broken? your wind short? your chin double? your wit single? and every part about you blasted with antiquity? and will you yet call yourself young? Fie, fie, fie, Sir John! πονεῖς· διπλοῦν γένειον ἀλλ᾽ ἁπλοῦς ὁ νοῦς. A recent example of Greek composition is the brief paragraphs on current events in classical Greek at a site I have from time to time in leisure moments enjoyed for some years. Learning a language this way, where possible, is not only effective in improving one’s knowledge of it, it’s also quite fun, as mentioned above, and as, for example, the people at Eisenbrauns know, when they have their annual Valentine’s Day contest for putting together amorous compositions in ancient languages (see the 2011 results here). Well-known songs might also be good practice; I’ve long thought “Hard Rain’s a-Gonna Fall” and almost anything from Dark Side of the Moon would be suitable. Related to all of this, too, is the place of memorization (of lines and texts, not paradigms and individual isolated lexemes) in language learning. Hopefully, there’ll be opportunity for a post on that in the future. Until then, I would be glad to hear of others’ experiences, both good and bad, translating into and composing in ancient languages. These lines are also quoted in the introduction of the new publication of some of Wright’s letters. See my review here.